The IBPS SO Exam Prelims Exam is going to be conducted by Tomorrow and you have to get prepared in an efficient way to crack the questions asked in the exam. 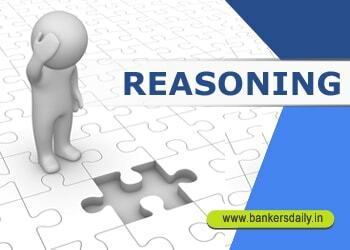 We have been providing questions to solve to prepare efficiently for the IBPS SO Prelims Exam 2017. Today we are providing questions on Seating Arrangements. Solve and crack your exams in the forthcoming days. D.1-5) Read the following information carefully and answer the question given below. 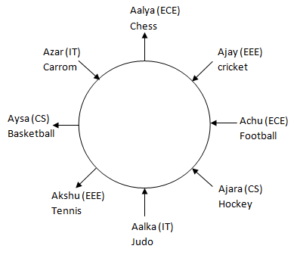 Ajay, Akshu, Aysa, Achu, Ajara, Aalka, Azar and Aalya are eight friends, studying in the same college, but different departments viz., CS, IT, ECE and EEE. At least two persons are studying in the same department. Each of them likes different sports viz., Cricket, Hockey, Football, Tennis, Judo, Carom, Basketball and Chess. All the above information is not necessarily in the same order. All of them are sitting around a circular table, in such a way five of them facing inside the table and the remaining facing outside the table. Achu studying in ECE department sits second to the right of Aalya, who like Chess and does not study in the CS department. The one who like cricket is an immediate neighbour of the one, who likes Chess and the one who likes Football. Aalka sits third to the left of the one who studied in EEE department who is an immediate neighbour of Achu. Aalka does not sit opposite to Achu. Aalka neither likes Football nor Hockey nor Carom. The persons who are studying in the EEE department sit opposite to each other and faces opposite direction to each other. Ajay studied in the EEE department and likes Cricket. Azar is studying in the IT department and sits second to the right of Ajay. The one who is studying in the CS department is an immediate neighbour of the one who is studying in IT and the one who studying in the EEE department. The one who likes Chess does not sit opposite to the one who is studying in the CS department. Aalya is neither studying in IT nor CS department. The one who is studying in the EEE department does not like Judo and Carom. Aysa, who likes Basketball and Akshu are sitting adjacent to each other and both are facing same direction. Immediate neighbours of Ajay faces the opposite direction. Achu does not face outside the table. The one who likes Basketball and the one who likes Hockey are studying in the CS department. Q.1) Who among the following studying in the ECE department? Q.2) Who among the following sits second to the left of Ajara? Q.3) Four of the following five are alike in certain way, based on the arrangement, find the one which does not belongs to the group? Q.4) Which of the following combination is true? Q.5) Aalka is studying in which among the following department? Ten persons are sitting in two parallel rows containing five persons each, in such a way that there is an equal distance between the adjacent persons. Persons sitting in row 1 face persons sitting in row 2. A, B, C, D and E are sitting in row 1 and faces north. K, L, M, N and O are sitting in row 2. Each of them likes different flowers viz., Aster, Begonia, Clover, Crocus, Daisy, Dahlia, Jasmine, Rose, Lily and Lotus but not necessarily in the same order. One who sits opposite to B likes Jasmine. One of the immediate neighbours of E faces O who sits at the end of the row. One who likes Aster is an immediate neighbour of M. Two persons sit between O and K. C likes Crocus. One who sits opposite to B sits second to the right of M. Two persons sit between C and D. Neither K nor O likes Rose. D likes clover and does not sit at the extreme end of the row. One who likes Daisy sits opposite to one who likes Lily. One who likes Lotus sits diagonally opposite to O. One who likes Daisy is an immediate neighbour of one who likes Dahlia. Neither A nor O likes Dahlia. Edoesn’t like Rose. Neither Jasmine nor Daisy is liked by L. Neither A nor M likes Daisy. Q.6) Who among the following likes Rose? Q.7) Who among the following sits opposite to one who likes Begonia? Q.9) If C is related to B, K is related to L in the same way, who among the following is related to one who likes Clover? Q.10) Which of the following combination is true?